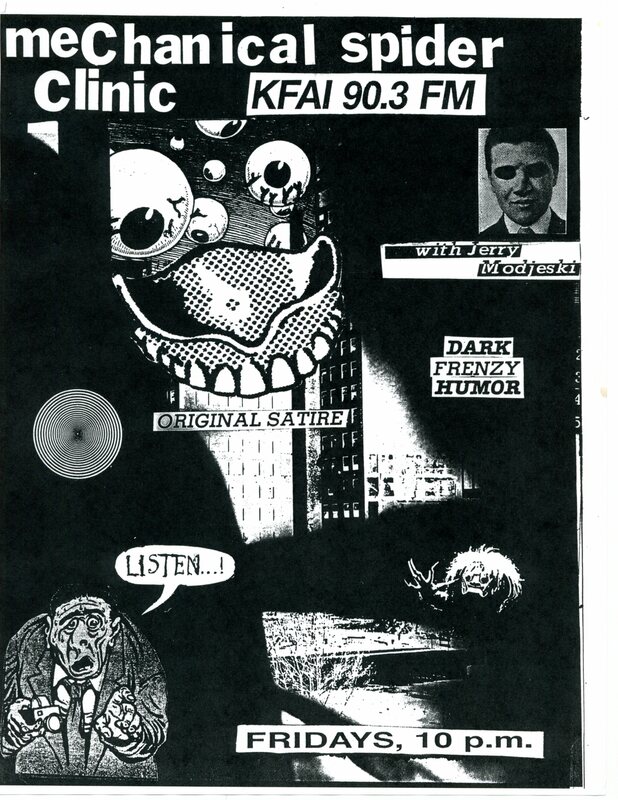 Jerry’s KFAI radio series of original comedy skits begins regular features Consumer Survival Biscuit, Life With Lazlo Morbid, and Bomb Theater (grade-Z movie matinee: Hot Rods From Outer Space!). Regular contributors Chuck Isle and Mark Masyga offer commercials for Liquid Executioner, Saint Watermain Place, Chez Bob’s Detail Recount Store, Dubb’s More-Gas Board, and read schedule highlights from TV Guise. High tension radio drama with J.B. “Touch” Skogmo and Tim Wynntoplotte, Pre-K Van Drivers begins with three thrill-packed chapters. Voices by Kay Kirscht, Andy Schultz. Poster created by Marc Myers.